Last Friday, I had the opportunity to spend a day at the Origins Game Fair. I had a great time, and one of the highlights was obtaining the Free RPG Day offerings from Wizards of the Coast for the past four years! I looked over each one on the trip back, and thought I would post some quick reviews. Today, I’ll cover the first two, and later this week, the remaining pair. 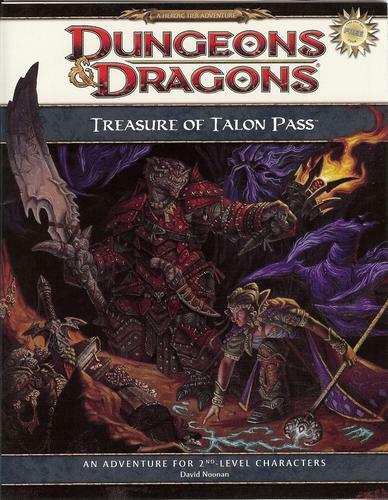 This adventure was WotC’s offering for 2008. Designed by David Noonan, the module is not tied to any particular setting, aiming for a more generic, plug and play feel, which makes sense given the intended audience. The dungeon itself is an old abandoned garrison in a mountain, the layout of which is fully mapped out on the inside covers. The plot involves the characters recovering a jade chalice of from inside the garrison. Unknown to the PCs, it has been taken over by a young black dragon and his kobold followers. The dungeon itself is fairly small, but there are encounters in nearly every room. 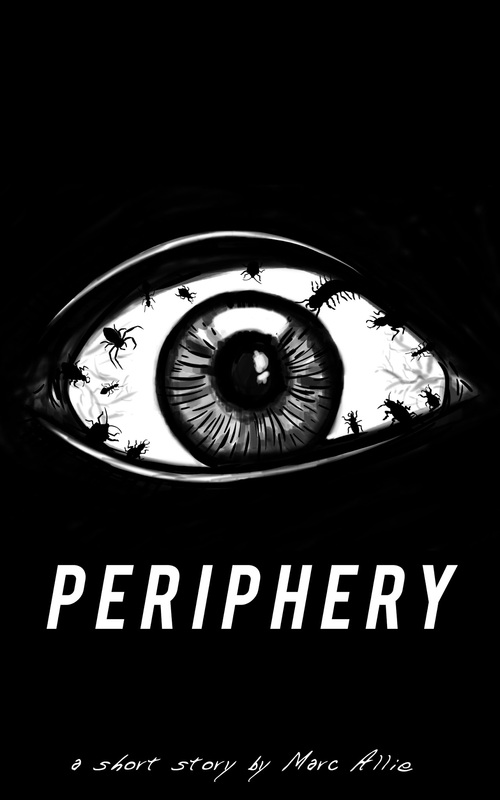 Twenty pages of adventure are included, followed by a five pregenerated characters. I can certainly tell this adventure was designed early on in D&D 4th Edition’s lifespan. The maps are not based on any of the Dungeon Tiles, and feel a bit bland. The backstory is about as plain as you can get, but at least a few different adventure hooks are provided. There are far too many combat encounters, in my opinion; getting through the entire adventure would be quite a grind. There are no skill challenges, few interesting environmental or terrain effects, and only a single trap. There is a decent start to an adventure here, but it’s disappointing as a whole. Rating: 9 on a D20. Designed by Keith Baker, the adventure for 2009 is set in Eberron, a campaign world I know very little about. I would have appreciated a brief synopsis of the setting, as the adventure includes many elements that are unusual for standard D&D (orcs and humans living together, the warforged, strange monsters, etc.). The PCs are tasked with defending a small swamp village from an invasion of abberant monsters and strange cultists. There are many opportunities for role-playing in the village, which is always a nice inclusion. As the party discovers and explores the cavern lair of the cult, they encounter some genuinely creepy creatures from the Far Realm. Several new magic items, including a very interesting artifact, are also provided. The adventure wraps up with a set of pregenerated characters. 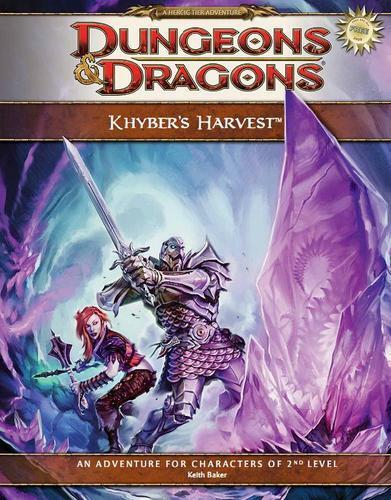 Khyber’s Harvest is a very solid adventure. There are many interesting things to do besides just whack the bad guys until they are dead. The strange crystals, bizarre aberrant opponents, and a very strong climactic encounter combine for a great introductory experience. The maps seem to use standard Dungeon Tiles, and the inclusion of a two-sided full-size tile in the adventure itself is very welcome. There is a feeling of quality here that was missing from Treasure of Talon Pass. The flavor text in particular is very well done. All in all, this is a highly useful adventure, even if you don’t play in Eberron. Rating: 13 on a D20. Later this week, we’ll check out Bloodsand Arena and Domain of Dread: Histaven. This entry was posted in D&D, DM Advice, Dungeons & Dragons, Roleplaying and tagged 4E, Reviews. Bookmark the permalink. I picked up a couple at Origins as well. I’ve been out of gaming for a long time and the whole Free RPG Day concept is new to me. I’ve not tinkered with 4e D&D yet so it was nice to get a peek at some product, without any investment. I think I’d like to dip my foot in, but the rumors of a 5th edition on the horizon have me a bit scared and thinking that perhaps I should hold off a bit.